Depending on where you live, the approach of winter can mean saying bye-bye to your favorite fruits and vegetables. Depending on where you live, the approach of winter can mean saying bye-bye to your favorite fruits and vegetables. On these chilly days in January, it may seem difficult to avoid slipping into a meat-and-potato-induced hibernation, completely devoid of those healthy vegetables we’re always being told to eat. Although technically salads are still an option, during single-digit weather it feels like the last thing in the world you want is a plate of cold, raw vegetables. But never fear! Though it seems too good to be true, you can keep your belly full and warm without hindering progress towards your goal of dropping ten pounds by Valentine’s Day. Soups, stews, consomms, and chili! Creamy, rich, meaty, smooth, hearty, chunky, brothy – hot. It’s just what you want on a day you had to spend twenty minutes de-icing your car. Soup is surprisingly easy to make and with thousands of recipes online, inspiration is a click away. But still, we have to be careful because just like salads, some soups are healthier than others. 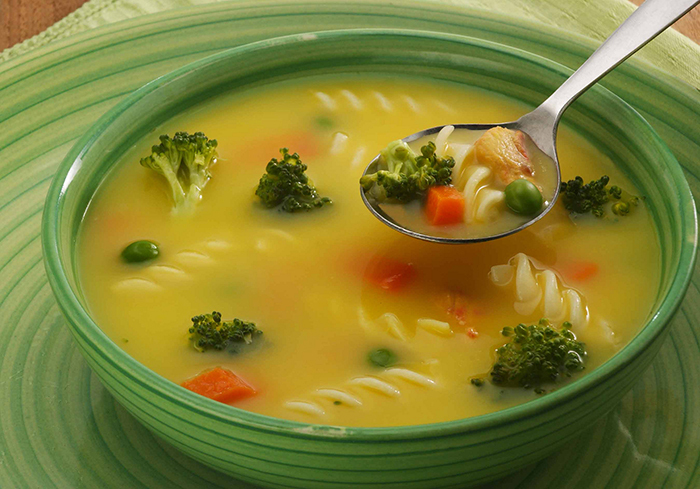 A bowl of Panera’s cheddar broccoli soup has about as much fat as two McDonald’s cheeseburgers. Put in perspective, a large Wendy’s chili has only half the fat and significantly more protein. So how do we navigate this kind of spectrum? 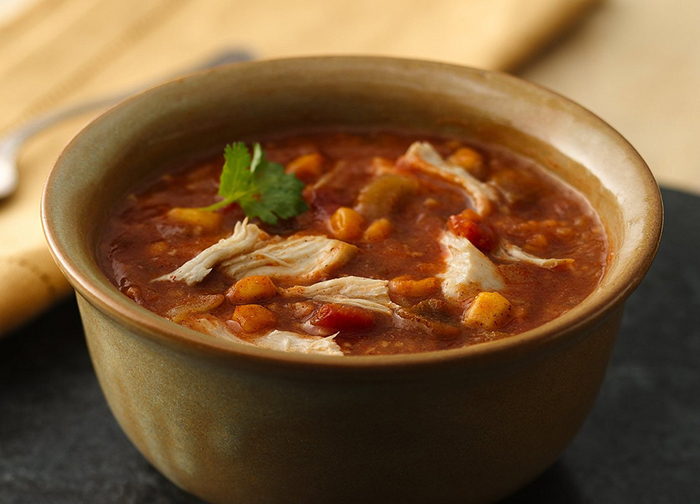 Below are a few tips for how to make favorited soup recipes a little healthier. Use turkey instead of beef – A big pot of homemade chili is the ultimate convenience food. Perfect for lunch, dinner or an afternoon snack, chili is as easy to make homemade as sauting some onions and opening a few cans. To make your chili healthier, just substitute the beef for ground turkey. To seal in the moisture of the turkey, season and cook the turkey first as mini meatballs before adding them to the chili. Watch out for sodium – The most common, yet most overlooked problem for soups is the amount of sodium. Be careful to look at the amount of added sodium when buying canned broth and/or canned vegetables. If you buy broth without added salt, you can always add a little salt when making the soup. It’s also important to keep in mind that you may not need as much salt as you think – as broth reduces, the flavor becomes more concentrated. Experiment with Asian soups – Instead of falling into that soup slump of tomato and chicken noodle, mix it up a bit with something more exotic. 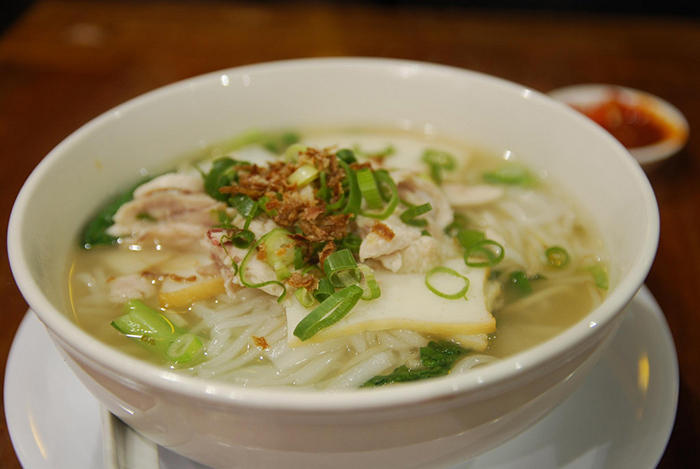 Asian-inspired soups can range from hot to sweet to savory, and come flavored with shitake mushrooms, thickened with coconut milk, bulked up with vermicelli rice noodles, and topped with meats, tofu, and leafy greens. Again, be cautious with some of the recipes out there because seasoning ingredients like soy sauce, fish sauce, and canned broths can had a lot of added salt and MSG. Pack it with protein - In order to transform a bowl of soup from a light lunch to a full dinner, choose ingredients with a lot of protein to fill you up. Chicken, turkey, and fish are popular in soups and are naturally low in fat. Bulk up soups even more with protein-rich legumes like beans and lentils and hearty winter vegetables like eggplant and squash. Soup doesn’t need to be boring diet food out of a can. Making hearty soups and stews yourself this winter can help you avoid packing on the pounds while still giving you something to look forward to even in the middle of a polar vortex.